Larry Johnson, Kansas City Chiefs Superstar Running Back, has personally hand signed this action 8x10 horizontal photo with a silver sharpie. The Mahogany custom wood frame measures 14x17 inches, and includes white over black double matting. Conservation Clear glass was used on this fine piece to protect the autograph from fading due to UltraViolet (UV) Rays. 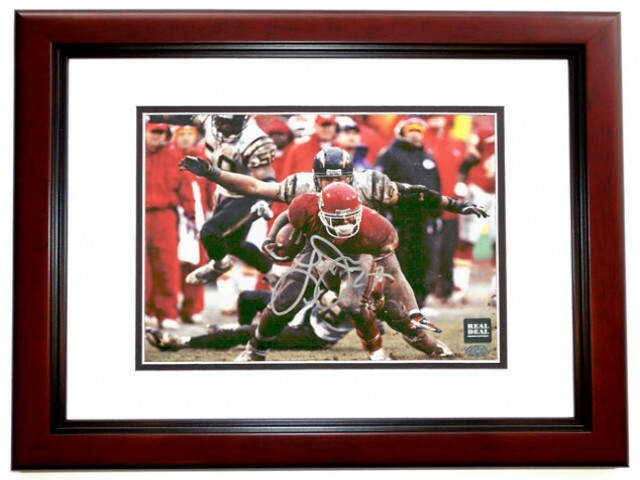 This custom made frame is ready to hang on the wall, and would look great in any office, bedroom, or man cave! The photo comes complete with a Certificate of Authenticity (COA) and NEW Authenticity Holograms from The REAL DEAL Memorabilia, Inc. Get the REAL DEAL!